So we did in one case (the other case we’re still working on). For the one that fully resolved, my client received something along the lines of 60% of her medical expenses. There were too many other victims, many of them with injuries far more serious than my client’s. We were able to get other medical expenses reduced, and thankfully there was Personal Injury Protection (PIP) available, so my client had a little bit of a take-home. But, it wasn’t what it should have been. And sadly, there was no other source of recovery–no UM/UIM, and no chance at recovering personal assets of the defendant driver. Perhaps the simplest way is for each automobile accident victim to get a pro rata share of the proceeds based on total medical expenses. So, if the total insurance available is $60,000, the total of all medical expenses is $100,000, and your client had $20,000 in medical expenses, your client would get total of $12,000. ($100,000/$20,000 = 20%; 20% x $60,000 = $12,000). This method has some appeal–it is completely objective, and there is no need to compare amounts of non-economic damages (pain, suffering, inconvenience, etc…). For cases that warrant the expense, a mediator or arbitrator (often a retired judge) can be brought in to help settle the matter. Another method is to allow the court to decide–everyone files a lawsuit, the cases are consolidated, the defendant admits liability, and the judge or jury decides what everyone gets. Or, the defendant could place the money into the court with an interpleader action, basically inviting all of the plaintiffs to come to court and fight it out. One particular consideration should be other means of recourse. 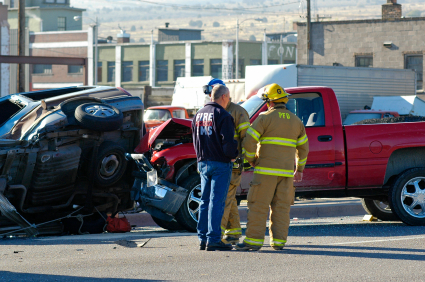 Some accident victims may have UM/UIM insurance coverage available–meaning that they are more likely to be able to recoup their losses elsewhere. Lawyers who have access to other potential sources of recovery may be hesitant to take a discount on the first part of the case, though, until they have some assurance about what they can indeed recover from the UM/UIM insurance company. In any event, everyone is going to end up with less than they deserve. This is one reason why it pays to have good UM/UIM insurance. We recommend everyone get as much as they reasonably can afford. The increase in premiums isn’t significant, and $100,000 is the bare minimum. We highly recommend more.